Elevator toe cap oxford shoe, handcrafted, with upper in full grain brushed calfskin of a luxurious semi-shiny effect. The real leather sole is jointed and sewn at sight. The overall height increase ranges from 2.4 to 3.1 inches depending on the model chosen. 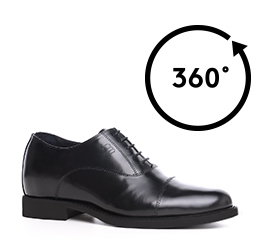 An exclusive shoe with clean lines and elegant design, ideal for the groom and formal occasions.